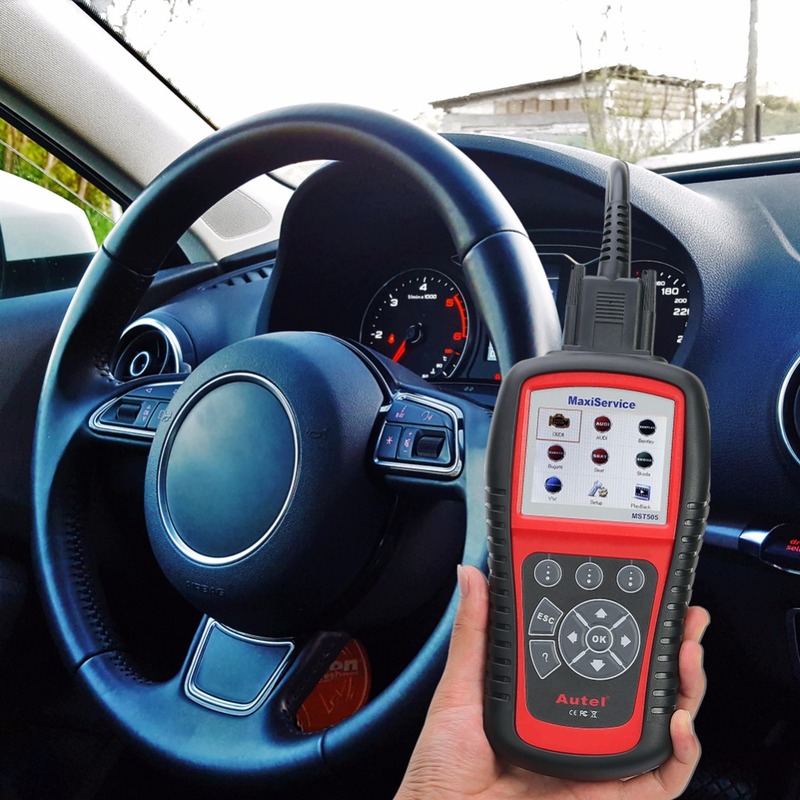 Autel, as one of the world's leading manufacturers in the automotive aftermarket, dedicates itself to developing professional diagnostic tools and translating global clients' needs into superior cost-effective and innovative products with strong R&D and production capabilities. 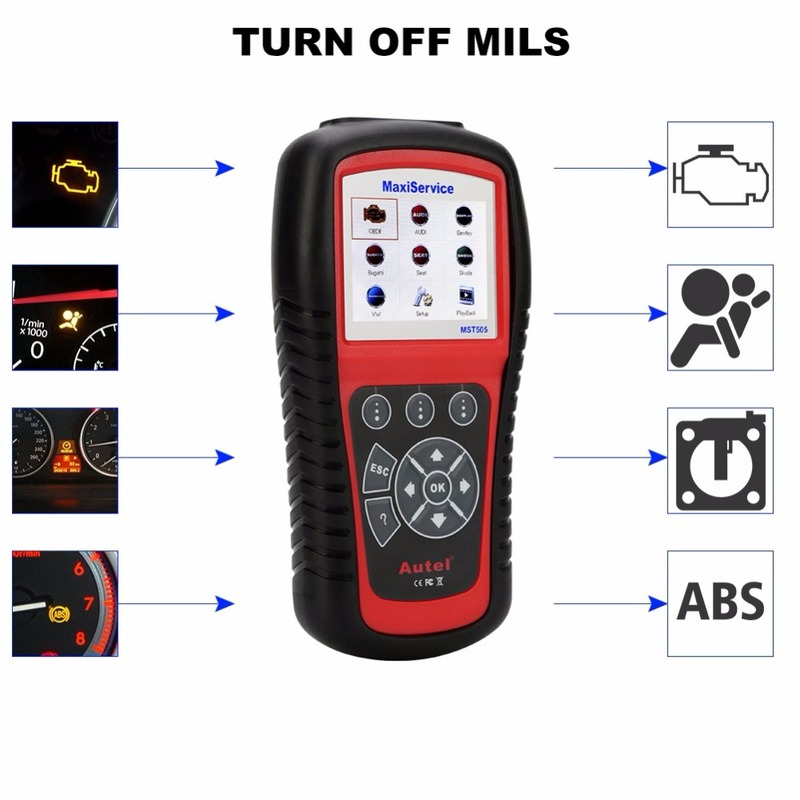 MaxiService MST505, as one of Autel's powerful multifunctional diagnostic tools featuring full OBDII functions and user friendly design of multilingual menu, data graphing, DTC lookup, and printing data etc., is an OE-level diagnostic tool specially designed to add benefits of oil reset and EPB service, and all system diagnoses for most VW/Audi/Seat/Skoda vehicles which would greatly help professional technicians and auto repair stores. OE-LEVEL COVERAGE: MST505 is specially designed for most VW/Audi/Seat/Skoda vehicles sold worldwide since 1996, or newer models being OBDII compliant, including those equipped with universal protocol Control Area Network (CAN). 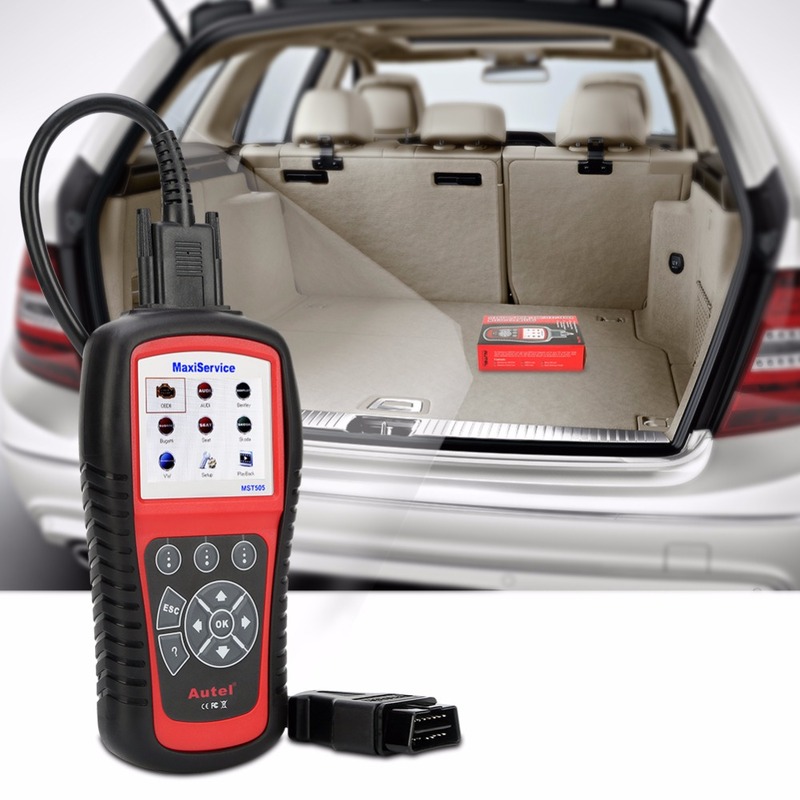 ALL SYSTEM DIAGNOSES: You can use this diagnostic device to check engine, airbag, ABS, A/T and most other systems in VW/Audi/Seat/Skoda vehicles to enhance your vehicle safety as well as your security and improve the efficiency of diagnostic work. 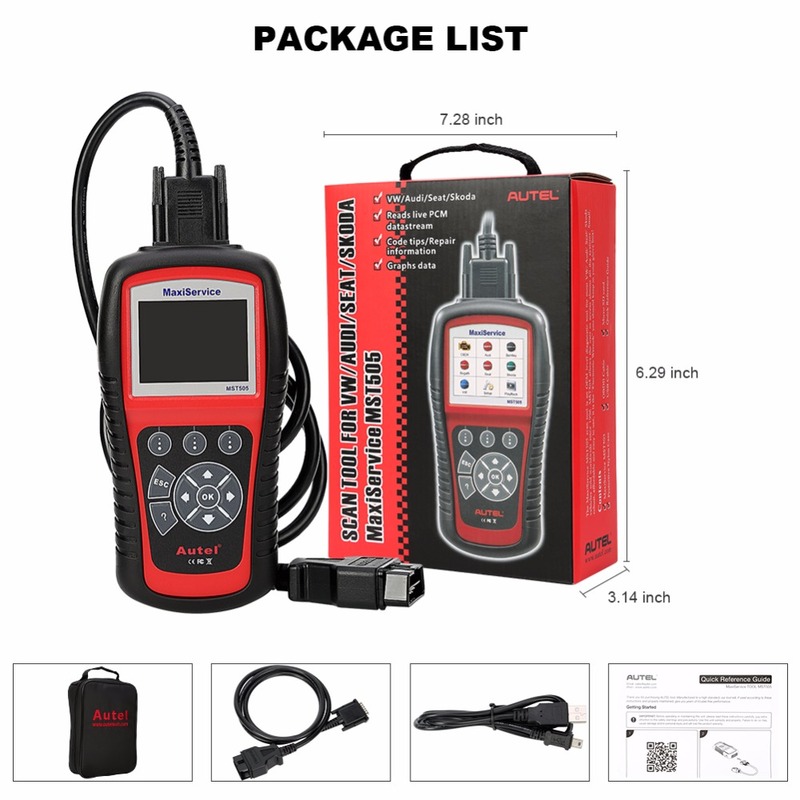 OIL & EPB SERVICE: Besides being able to Read/Erase Codes, this diagnostic tool also provides advantages of EPB Service to maintain the electronic braking systems and manual/auto Oil Reset for most VW/Audi/Seat/Skoda vehicles. 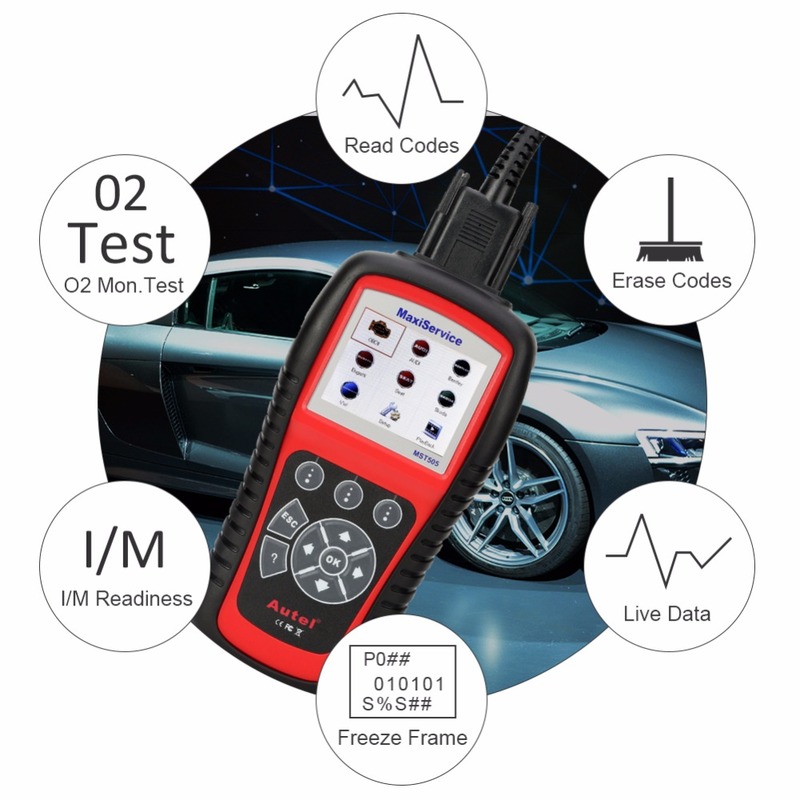 FULL OBDII FUNCTIONS: Featuring OBDII functions as Read/Clear Codes, View Live Data/Freeze Frame Data/Vehicle Information, Retrieving I/M Readiness Status and O2 Monitor Test etc., MST505 is built to enable technicians to accurately diagnose complex problems. USER-FRIENDLY DESIGN: This scanner is ergonomic, sophisticated yet easy-to-use and highly reliable with strong housing of protective rubber boot. Featuring multilingual menu, data graphing and DTC definitions, it is also able to print data via PC. WARRANTY & SERVICE: Autel warrants to its customers that this product will be free from all defects in materials and workmanship for a period of one (1) year from the date of the original purchase, subject to some terms and conditions. 1. 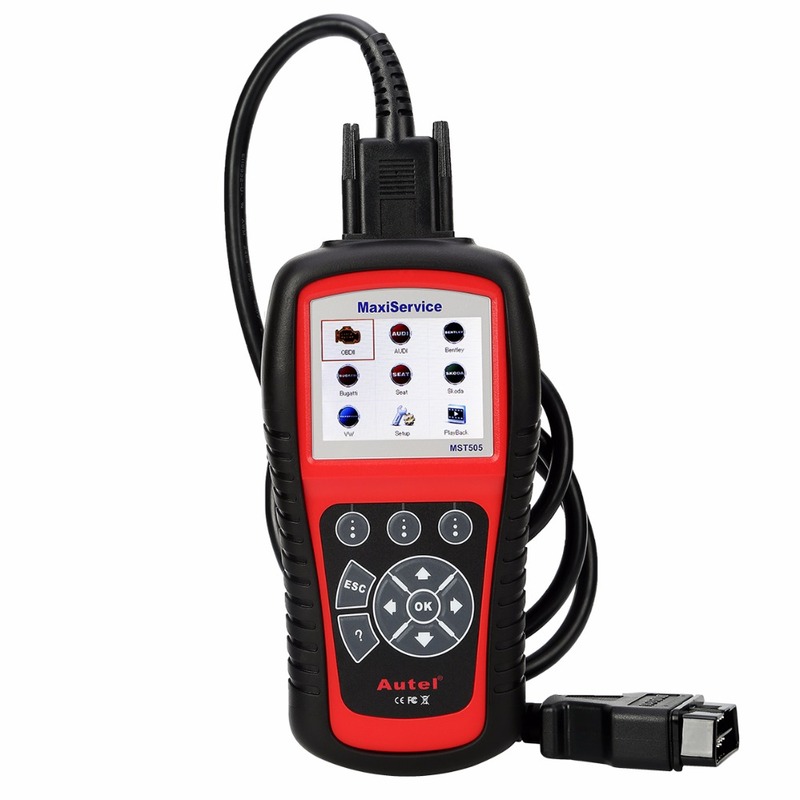 Vehicle Coverage: Autel MST505 is specially designed to work with most Volkswagen, Audi, Seat and Skoda sold worldwide of 1996 or newer models being OBDII compliant, including those equipped with universal protocol - Control Area Network (CAN). By using Volkswagen proprietary diagnostic protocol, it allows users to get access to almost all VW's systems. OE-Level All System Diagnoses: Reads, erases Diagnostic Trouble Codes (DTCs) and turns off MILs of engine, airbag, ABS, A/T and most other systems in VW/Audi/Seat/Skoda vehicles. 1) Manual Reset: For Most VW and Audi vehicles being OBDII compliant can be reset manually by technicians. 2) Auto Reset:For Most VW, Audi, Seat and Skoda vehicles being OBDII compliant can be reset automatically by the scan tool. Electrical Parking Brake (EPB) Service: Being capable of retrieving fault codes information from the ECU of VW/Audi/Seat/Skoda vehicles, the applications include deactivating/activating the brake control system, assisting with brake fluid control, brake diagnostics, opening and closing brake pads, setting brakes after disc or pad replacement and also reading and clearing EPB/SBC trouble codes to maintain the electronic braking systems safely and effectively. 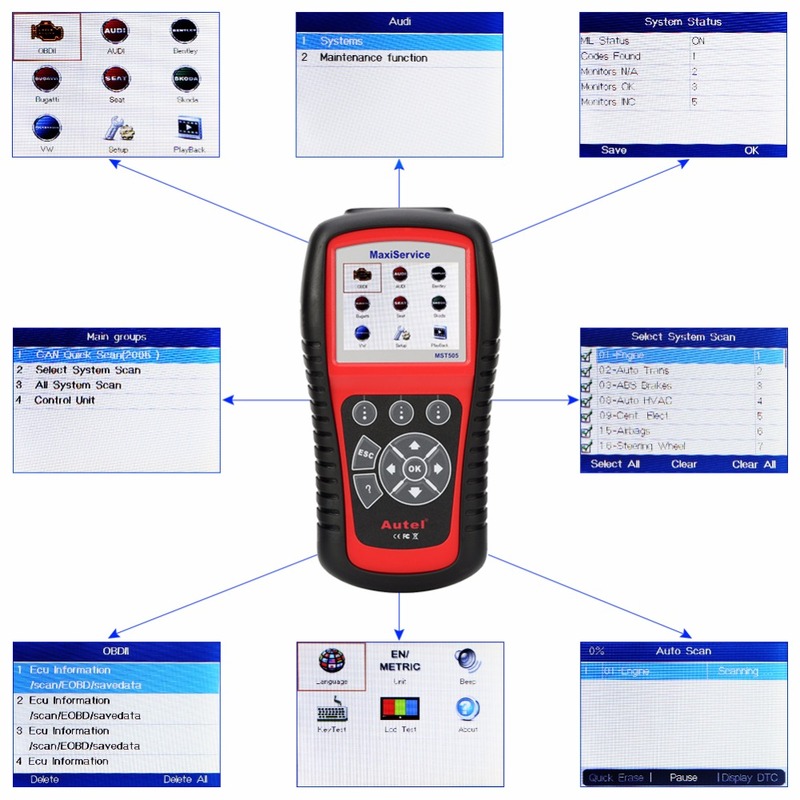 Read Codes: Retrieves generic (P0, P2, P3 & U10) and manufacturer specific (P1, P3 & U1) DTCs. Erase Codes & Reset: Turns off MIL light, clears DTCs and resets monitors. Live Data: Allows viewing of live or real time PID data of vehicle's computer module(s). Freeze Frame: Allows the technician to view the vehicle's operating parameters at the moment a DTC (Diagnostic Trouble Code) is detected. Retrieving I/M Readiness Status: Shows whether the various emissions-related systems on the vehicle are operating properly and are ready for inspection and maintenance testing. O2 Monitor Test: Allows retrieval and viewing of O2 sensor monitor test results for the most recently performed tests from the vehicle's on-board computer. On-Board Monitor Test: Retrieves and displays test results for emission-related power train components and systems that are and are not continuously monitored. Viewing Vehicle Information: Enables retrieval of Vehicle Identification No. (VIN), Calibration ID Nos. (CINs), Calibration Verification Nos. (CVNs) and In-use Performance Tracking on 2000 and newer vehicles that support Mode 9. Modules Present: Allows viewing of the module IDs and communication protocols for OBDII modules in the vehicle. 4. Playback Data: Allows viewing data from last test recorded by the scan tool. 5. DTC Lookup: Allows user to search definitions of DTC stored in built-in DTC library. Troubleshooter codes tips guide technicians to the root cause of trouble code faster, saving diagnosis and repair time. 6. Data Graphing: Displays the data results in graphic way for efficient diagnostic work. 7. Multilingual Support: English, Spanish, French, and German. English is the default language. 8. Print and Update: The Print Data function allows printing out diagnostic data recorded by the scan tool or customized test reports by connecting the scan tool to a PC or laptop with the USB cable supplied. 9. 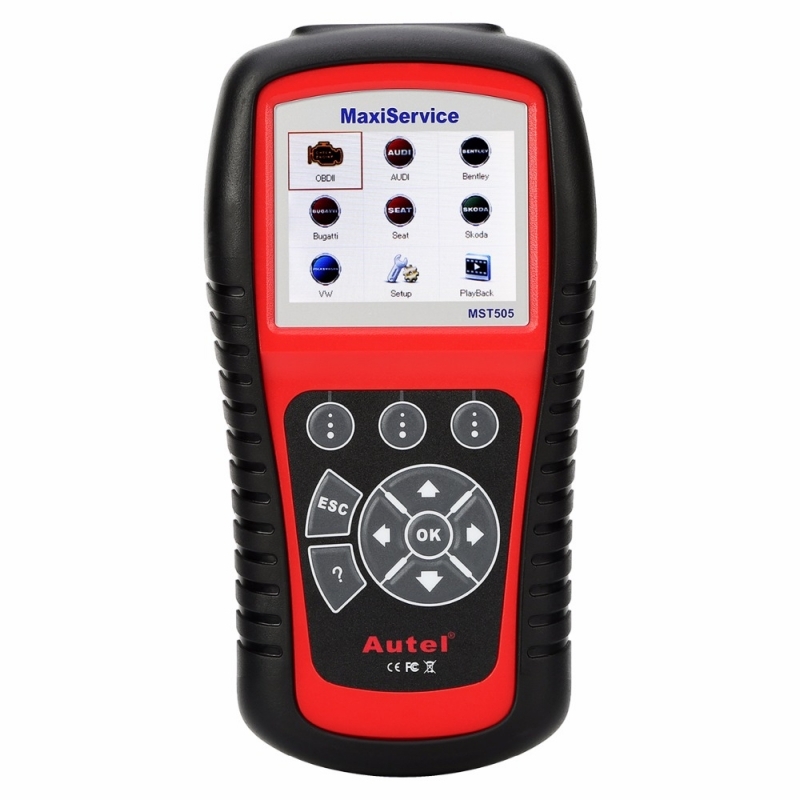 Warranty and Service: Autel MST505 carries with limited 1 year warranty from date of sale to ensure it is reliable and suitable for diagnosing work. 1. Don't connect or disconnect any test equipment with ignition on or engine running. 2. Do not erase the codes before the system has been checked completely by a technician. 3. An I/M Readiness Status result of "NO" does not necessarily indicate that the vehicle being tested will fail the state I/M inspection. For some states, one or more such monitors may be allowed to be "Not Ready" to pass the emissions inspection. 4. Deactivate the EPB system before carrying out any maintenance/service work on the brakes such as changing of pads, discs and calipers. The EPB system must be activated after finishing the maintenance/service work on the brakes. Make sure the vehicle is properly blocked before deactivation/activation of the system. 5. Users could update the scan tool ONLY after registering the tool on Autel official website, and then could download software, update online, retrieve information as well as get warranty service. 6. Please close the anti-virus software in your PC when updating the device. 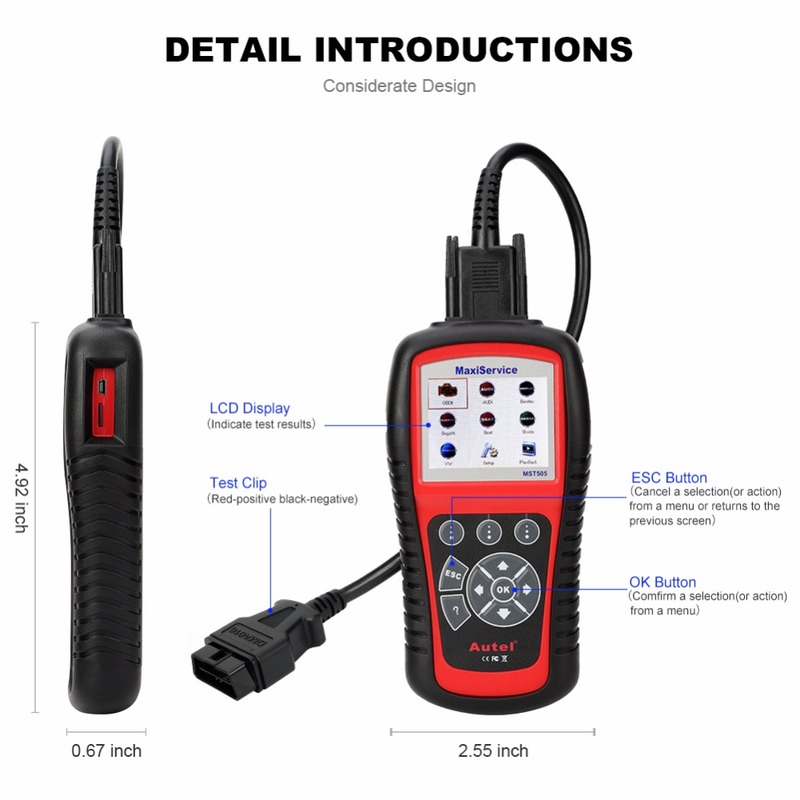 Feel free to get technical support via email/Q&A, or hotline on our official site, or Facebook, or Twitter, if you are unsure if the scanner tool is suitable for your vehicle, or any questions.